Extreme cold temperatures are just around the corner. 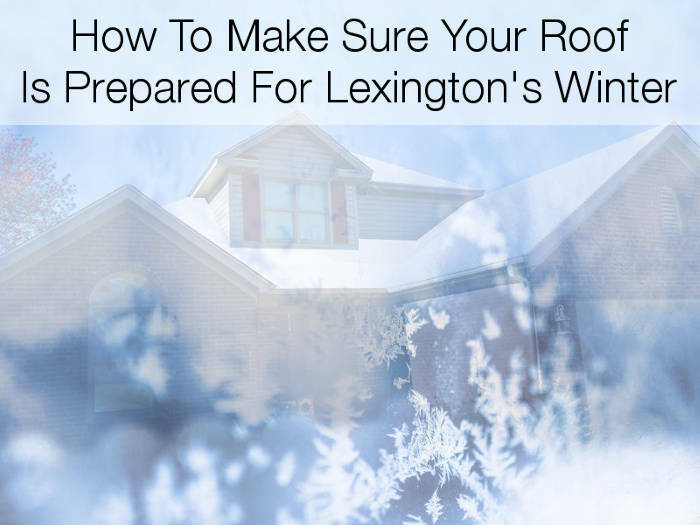 To keep your home well protected, here are some tips to prepare your roof for Lexington’s cold winter months. Before we get into a list of things you should check on your roof, it’s worth noting that we offer a free service for inspecting roofs. We’ll provide you with an honest analysis of your roof’s condition that’s not backed by a pushy sales tactic. Questioning our tactics? Well, we can’t blame you! However, before you make any assumptions and miss out on a free benefit, take a second to see what other homeowners have had to say about their experience with our inspection services. Ready For A Free Inspection? One of the easiest things to identify and take care of would be to look for and remove debris or build up such as fallen tree limbs, excess leaves and algae or lichens. Keeping your roof free of any type of foreign substance or material is going to ensure that it doesn’t retain unnecessary moisture or a collection of ice in the debris, which can slow the melting process. Additionally, you’ll also want to check your gutters for build up as well. If your gutters become clogged, this can also lead to a problem by allowing the ice to form in a large deposit, which can easily allow water to penetrate up underneath your shingles as it melts and then refreezes. You can learn more about this problem in this post. Next up would be to inspect your shingles and other areas on your roof, specifically the flashing. When inspecting your shingles, there are two specific things you’ll want to look for. This is an obvious sign that no matter what the season’s weather is, you’re definitely going to have problems. If you’ll look closely, you can see the tab in the middle is creased. This is generally caused by excessive wind gusts. Your roof is likely to leak or be penetrated by the snow and ice if your tabs are bent, cracked or creased. Another delicate area includes the flashing on your roof. 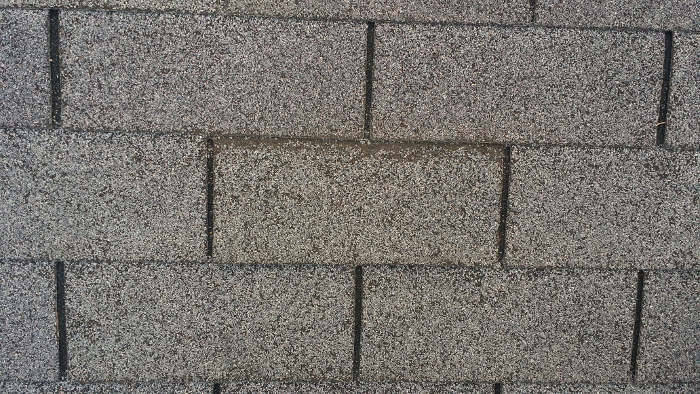 It’s most commonly used in areas where the shingles meet a vertical surface. If installed, it will prevent water, snow or melting ice from penetrating underneath your shingles. 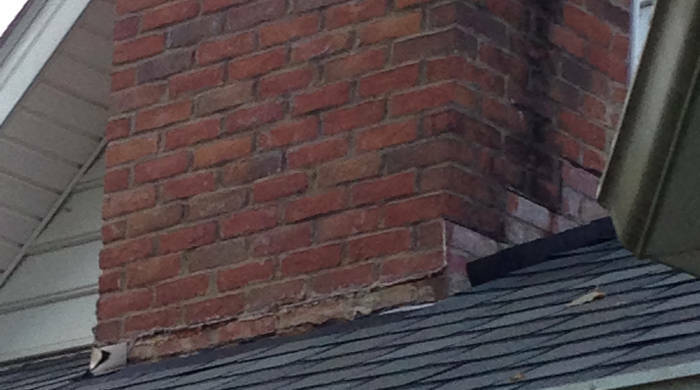 Here’s a chimney that is missing some flashing. After all the exterior areas have been analyzed, the final steps you should take will be on the inside of your home. 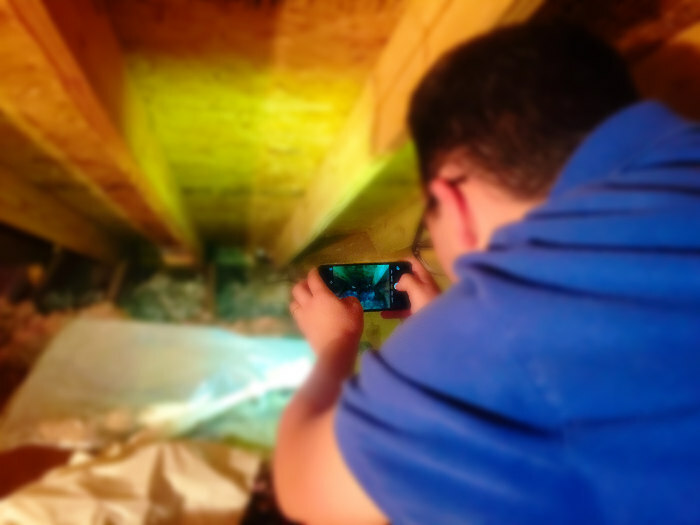 Areas in your attic will likely be hard to spot, so use a flashlight. Look for signs of water damage. This will often be saturated or dark colored areas in your wood that look unnatural. Make sure that all of your insulation is in tact. Pay special attention to where your insulation meets your rafters. If you have a material that resembles plastic or metal between the insulation and rafters, you’re probably in good shape. If not, you may want to consult with us on your options to provide your roof with a more breathable solution to help its air flow. The final and last step would be to cover all rooms in your home by inspecting the ceiling for signs of water spots. Take note that these areas can often be very hard to identify if you’re not trained to notice them due to the fact that they often start out smaller than the size of a dime. Common problem areas can often be found near vents and corners. Peace of mind doesn’t have to come with a cost. 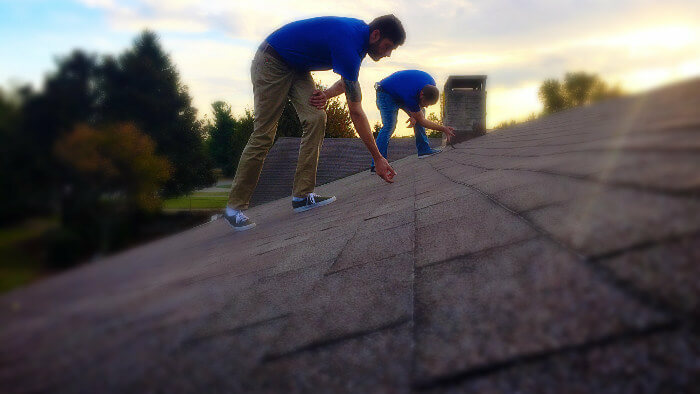 One of the valued services our clients appreciate is our free roof inspection services. We offer non-biased advice and documentation so that you can make an informed decision on how to go about correcting any related issues your roof may have. If we find that your roof has been impacted by the weather, we can help. We specialize in working with your insurance company if in fact you decide you want to file a claim to replace your storm damaged roof. At the very least, if we find that your roof is in perfect working order, you’ll never have to question its durability and performance when Lexington’s winter storms finally arrive!